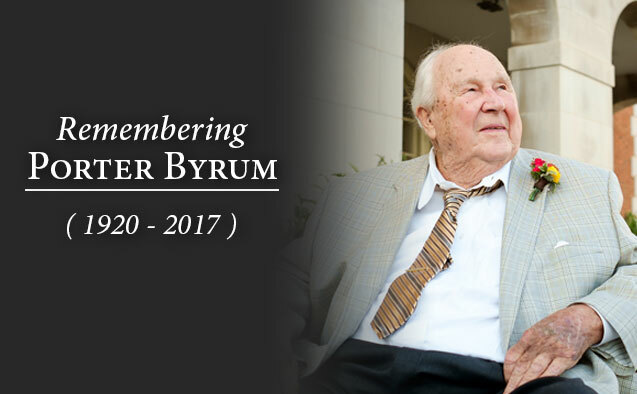 No one has been a more generous benefactor to Wake Forest than Porter Byrum, whose lifetime giving totaled more than $120 million. Thanks to decades of generosity, more than 350 Wake Forest students have been afforded the same opportunity for the quality education he appreciated so much. 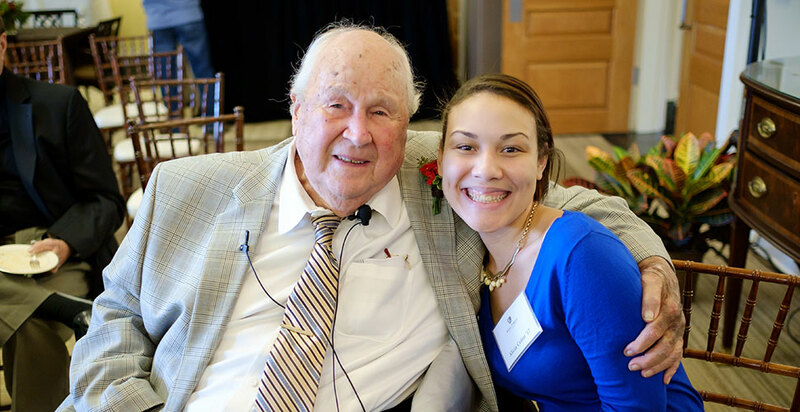 In a concluding act of extraordinary generosity that will make college more affordable and accessible for generations of students, Porter B. Byrum (JD ’42) has donated more than $70 million to Wake Forest University for scholarships. Byrum’s latest gift – the largest in Wake Forest’s history – is approximately half of a bequest of more than $140 million for student financial aid. The rest will be divided equally between Queens University of Charlotte and Wingate University. The late Charlotte attorney, businessman, philanthropist and alumnus was a champion of higher education, and this gift furthers his legacy of creating opportunity for deserving students. He died in March at the age of 96. Visit Wake Forest’s remembrance site, which features Byrum’s story of opportunity, a photo gallery and a guestbook, at porterbyrum.wfu.edu. No person has been a more generous benefactor to Wake Forest, whose lifetime giving totaled more than $120 million. His generosity spanned the course of decades, and because of him, more than 350 Wake Forest students have been afforded the same opportunity for the quality education he appreciated so much. Notably, in 2011, he donated the Park Road Shopping Center in Charlotte to Wake Forest, Queens and Wingate. “More than anything, Porter loved spotting potential – be it in an employee, a business deal, a piece of land or a young person – and providing an opportunity for that potential to grow. His greatest joy was not in the recognition of what he had given, but rather, in watching what those who were given an opportunity would do with it,” Hatch said. In addition to numerous scholarships that bear his name, Byrum (JD ’42) served as a member of the Law Board of Visitors, received the Carroll Weathers Award – the Law School’s highest honor – and received the Distinguished Alumni Award. In 2011, Wake Forest named its new admissions building the Porter B. Byrum Welcome Center and his portrait hangs near the entranceway. Alicía Colón is a senior psychology major from Charlotte. She had the pleasure of meeting Mr. Byrum at a scholarship brunch in 2014. Porter Byrum with Alicía Colón. Current and past scholarship recipients echoed Colón’s gratitude. To honor Byrum’s legacy, Wake Forest will initiate the Byrum Challenge to rally alumni and friends to the cause for which he cared so deeply. Wake Forest intends to set ambitious goals to enhance the scholarship endowment in keeping with his passion to create opportunities for aspiring young people.